Jaded Blossom: Guest Designer, Jaymie! This month Jaded Blossom is celebrating their 1st birthday and I am honored to be a part of this month long celebration! Each day for the ENTIRE month of December, there will be a new guest designer --how awesome is that?! So on that note, today is my day! I absolutely just love these new birthday and cupcake stamp sets! If you haven't gotten your crafty hands on this set, you need to hurry on over to the Jaded Blossom store and buy this awesome Birthday kit! The Birthday kit is of LIMITED quantity and they aren't selling the stamps separately till sometime next year--so grab yours quick before they run out! What a cute idea. Love the box! What a sweet project!!!! I love the papers you used:) The image is super sweet and just love your embellishments!! Great job! These are so cute! I just love that cupcake card. Thanks for sharing today! LOVE this! and the colors are awesome! You did a great job! OMG...this gift set is ADORABLE! This is soo cute Jaymie! I love how you colored the Cupcake Cutie!! 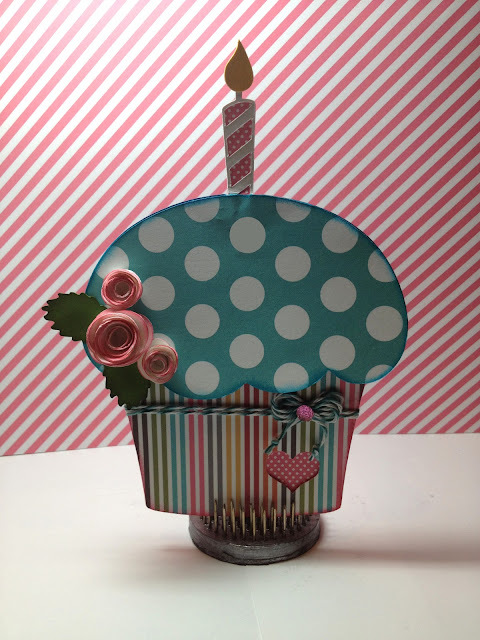 And your cupcake box and card is too cute! What a sweet set. The girl is so cute and colored beautifully! Jaymie what a great job!! Thank you for sharing! Going to follow your blog too! Aww! I LOVE the SUPER CUTE cupcake card and the ADORABLE cupcake box! I love the colors and that Cupcake girl is SO CUTE! I love the cupcake card! Adorable!!! I am loving that paper! It is definitely going on my Christmas List. The cupcake is absolutely adorable as well. This is awesome!! Great job, Jaymie! This is so Beautiful. I just love the Cupcake Card. The flowers look awesome and so is the way you colored the image. I love your cupcake project. It is absolutely adorable. Great colors used. Wow, super cute project. Love it!! This is just adorable! I love the colors!! This paper is so bright & cheery! Great job! love love the card so cute. This is so adorable!! I love your coloring on Cupcake Cutie! What a great project!! SO cute!! This is so totally awesome! Love me some cupcakes. Awesome job! Love the box and card! Great job, thank you for sharing. This is sooo cute. Just love it. adorable set! I absolutely love the colors! This is really beautiful! The coloring is amazing and I just LOVE this project:) TFS and being a guest designer. OMG this is so super adorable!!! LOVE the cute image and the GREAT stamps!! Such a GREAT birthday gift!!! wow. what a great job! The colors and embelishments are great together, and I love how you added the birthday girl to the box. Love the project! This is so cute Jaymie! This is my favorite by far!! Oh man just wonderful!!!! Jaymie...WOW, I love everything about your birthday project! The colors, papers, card, box, but where's the cupcake? Did you eat it? Amazing job! These are the sweetest bday designs. Super duper fabulous! How adorable--I like the papers you used.